We hold on to the things we love longer than we should. Our baseball card collection, probably worth the paper it’s printed on but possibly worth a fortune — we sock it away in our closet because, well, you never know. That final shred of the blanket we were brought home in from the hospital, frayed so completely and worn so thoroughly that to call it anything more than a haphazard scrap of knitted thread would be a misnomer — we carry it with us every time we travel because it still somehow keeps us warm. We hold on to these things because they mean something to us beyond their market value or even their tangible contribution to our lives. We hold on to them because they give us access to an emotion that the mundane routine of our lives does not. They are special in spite of how terribly commonplace they are. The Philadelphia Union have been “terribly commonplace” in each of their years of existence. Fans have clung on to the “you never knows” and “haphazard scraps” because, frankly, there hasn’t always been much else to cling to. Danny Califf, Sebastien Le Toux, Vincent Nogueria, and Tranquillo Barnetta — even a slow-to-spin coaching carousel or an endless meme of goalkeeper-related self-deprecation — all kept close to our hearts, even though we knew they could never be enough by themselves. The season itself was a mundane routine, slow to start, aimless in the middle, and without purpose by the end. However, there were three truly bright spots on the 2017 Union, things that fans can carry with them through the winter. The Union scored two fewer goals in 2017 than they did in their postseason campaign of 2016. They scored 48% fewer than the top scoring team in the league, Toronto FC, and never truly identified what their process was for going about scoring more. Yet, the most profound outcome of this otherwise lost season was who scored those goals. C.J. Sapong set the franchise record for goals in a season on the final day of the 2017 campaign, bagging a brace and raising the bar. The record-setting goal was a monkey spun and dapped off Sapong’s back. It was a catharsis, one that should end the debate about the forward’s ability to write his name on the score sheet consistently enough to warrant a continued place in the XI. He can certainly improve areas of his game and would have benefited from some regular, obvious squad rotation. However, the impact he made is clear. Only seven players in the league scored more goals than Sapong, and he finished the campaign tied in that category with league legend, Sebastian Giovinco — furthermore, he scored more than Jozy Altidore, Eric Torres, Cyle Larin, Chris Wondolowski, or Clint Dempsey. The 2017 MLS SuperDraft may have set the all-time bar for “Best Player Names: MLS Draft Edition.” Reagan Dunk and Colton Storm were both first rounders, while Brandt Bronico and Dakota “What in Tarnation?” Barnathan followed in rounds two and three. Peguy Ngatcha came soon thereafter, as did three instances where teams voluntarily skipped their chance to draft a player altogether, before the Union stepped up and selected Jack Elliott. “Jack” was more highly ranked in NameBerry.com’s baby boy name rankings (No. 3) than he was on the Union depth chart when the seasons started (at least No. behind Josh Yaro, Richie Marquez, and Oguchi Onyewu). By the end of 2017, not only had Elliott become the best former West Virginia Mountaineer on the roster (no small feat considering his able competition, Ray Gaddis), but he had also become among the top candidates for MLS Rookie of the Year. 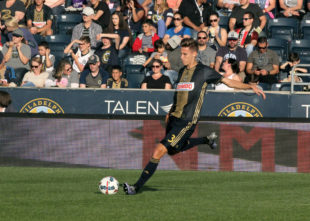 In 29 starts and 30 appearances after being forced into action April 1 because of an injury to Marquez, Elliott cemented his place in the Union defense and never looked back. Though subsequent regression seems to be one of the hallmarks of Union draftees (see: Marquez, Josh Yaro, Keegan Rosenberry), Elliott has the tools to be the exception to this rule. 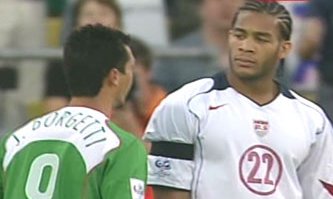 Oguchi Onyewu was already an American soccer “haphazard scrap” when he snuck into Union practice one cold day late winter. Rarely seen over the course of several season and several clubs, little was expected of the former U.S. national team leader when he was finally signed. Like Charlie Davies before him, most fans had only modest expectations, the harsh reality of time being more profound than the glimmer of “2010 World Cup Qualifying” nostalgia. Instead, Onyewu started 22 matches, was as positionally sound as anyone in blue, rarely was at fault in goals scored against the team, and gave an edge to a back four that had been lacking one since Maurice Edu’s injury. The highlight of his season might have been the goal he scored in his hometown, Washington, D.C., on his birthday, May 13th. It also just might have been finding a professional home after so many seasons in the European soccer wilderness. Onyewu should be resigned to this team in perpetuity: Playing until he simply cannot, and then coaching and mentoring thereafter. The 2017 Union were both a few bounces away from being a playoff team and a wildly underachieving and inconsistent team without an identity. These three players did more than was expected of them, and that should be celebrated. You can put those cards on the shelf for next year, too, because they’ll certainly still be worth something. Counterpoint: the striker for nearly every minute of every match, the “1” in our perpetual 4-2-3-1, scored some goals. This should never, ever count as a surprise. CJ outperformed the majority of those -1’s in teams using lone forwards. He also outperformed ANY Union forward in history. He also outperformed any US forward in MLS this year. While I would like to agree with you that we should expect our forward to score a lot, the last 8 years tell us something different. That being said, I don’t think this is a blip and expect CJ to hit at least 15 again next year. I think he would have done it last year if Curtin hadn’t been so hung up on moving him back to halfback in the middle of every game. I don’t consider CJ a surprise. He’s a quality player. Insofar as there’s a surprise, it’s the fact that he could score so many goals with no halfway decent CAM to get him the ball. Jack Elliott is not fast enough to play a high restraining line in the defense. Such a line is the first step of a high press defensive scheme. Switch him to #6. 1. Ballwinner 2. Game reader. 3. Devastating offensive distributor. 4. Considerably younger than Medunjanin and a better defender. He can, then an in game tactical opportunity becomes inverting the central midfield triangle. Pleasant surprise #1 for me: Home Form. The Union won more points and games at home than any other year in 2017. And, alot of big wins by good scorelines too. For a founding member who has sat in the same seats since 2010, that’s a big deal. I certainly had alot of fun at winning games this year compared to other years. It’s a shame we were so atrocious on the road, as even a moderate road point haul could have taken us to the postseason. Oh well, that’s the Union we have learned to love and hate. so ceding possession at home more often than not + having typically less than 80-82% pass completion + watching your goalkeeper pound balls to his striker, over his midfielders’ heads (when they cycled possession to him) was not a troublesome spot for you provided—– they were winning? I doff the cap to this point of view and money expenditure…..
…..because it is all terrible to me and totally unworthy. “Onyewu should be resigned to this team in perpetuity: Playing until he simply cannot, and then coaching and mentoring thereafter.” I second that.